Ukraine, Vladimir Putin, and Petro Poroshenko: Did the crisis in eastern Ukraine just end? Why the standoff with Vladimir Putin may have ended. Chocolate magnate and billionaire Petro Poroshenko a few days before his victory in the Ukrainian presidential election. The crisis in Ukraine appears to be over. Not that Ukraine itself is cruising toward democracy and prosperity. That road is littered with obstacles: The country is crippled with debt, mired in corruption, and quaking with instability. But after the May 25 presidential election and the overwhelming victory of Petro Poroshenko, the dangers of a Russian invasion—and an escalation of tensions leading to an all-out East–West confrontation—have receded. Poroshenko seems to be the right man for the times: a billionaire chocolate manufacturer and media mogul who has aspirations of an alliance with the European Union but also huge commercial interests in Russia. He’s a dealer; he’s pragmatic. He recognizes that no Russian leader, least of all Vladimir Putin, will let Ukraine spin entirely out of the Kremlin’s orbit and that, therefore, a healthy Ukraine must pay obeisance to Moscow even while leaning westward. Putin seems to see things the same way. 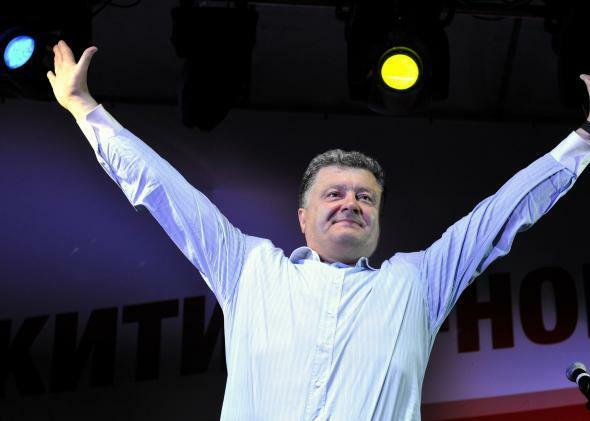 “We will, by all means, respect the choice of the Ukrainian people and will cooperate with the authorities that come to power as a result of the election,” he told foreign journalists the day before the vote, when polls put Poroshenko in a clear lead. The separatists, who have taken over several office buildings (and who prevented most voting stations in their cities from opening), haven’t given up their resistance. Serious fighting broke out on Sunday at Donetsk airport, and while Ukrainian forces have the upper hand at the moment, this could change and remain a question in the coming days. Still, without Putin’s support, the separatists can’t hold out long, especially if he’s recognized—and, even more, when he starts negotiating with—the newly elected Ukrainian president. For the moment, the Obama administration hasn’t let down its guard, nor should it. Putin has an interest in keeping eastern Ukraine in turmoil until he’s satisfied that the new leaders in Kiev pose no threat to Russia’s stake in their country. The armed separatists help him do this (whether or not he controls their actions). So do the 40,000 Russian troops that he’s deployed on the Ukrainian border. On Friday, U.S. officials—who, until then, had twice disputed Putin’s claims that the troops had returned to their bases—reported signs of preparations for withdrawal, at least by some of the Russian units. The officials emphasized some of the units, not all; enough to make the separatists tremble in their looming isolation, not quite enough to make the West sigh with definitive relief. Poroshenko said, in his victory address, that his first priorities as president would be to step up the “anti-terrorist” campaign against the eastern Ukrainian separatists—but also to open a dialogue with the region’s peaceful residents. He will no doubt turn up the volume on his side of the propaganda wars that Russia has been waging. It is significant that Poroshenko has pledged to cede ownership of his chocolate factory but not his television station, Channel 5, which has been a beacon for the opposition and will no doubt now act as the voice of the new government. The liberal protesters of the Maidan movement will be upset when Poroshenko sits down with Putin, but they will have to live with the fact that Moscow has interests in Ukraine—just as the eastern separatists will have to live with the fact that Donetsk will not become a city in Russia. The more these facts are recognized, the greater the chance that this tale might have a good ending. Of course, many in the West and in Ukraine will disagree on the definition of a “good ending.” If you define it as a free and united Europe, with Ukraine fully embedded in the European Union (and possibly NATO), dream on. Not only does this goal lie years or decades away (if it has any prospects at all), but pushing for it prematurely could spark a violent backlash, the likes of which we’ve been witnessing these past few months. On the other hand, if (like me) you define “good ending” as something resembling the status quo of late 2013, with Ukraine moving slowly and deliberately toward the West while staying anchored in Russia (in recognition of 1,000 years of regional politics), then the election is cause for optimism.